MALLA DEL LLOP Y LA CANAL”. Going up the camí de la rabossa and following the path that goes almost on a par with the water register booths, you will arrive at the” Anoguer “where you will be able to enjoy spectacular views, drink in the source of the anoguer. From there and about 200 meters away you will be able to visit the old snow cave, a memory of Famorca’s past as it was an important ice producer for all the towns of the Marina. From there you will be able to follow the route to the canal. 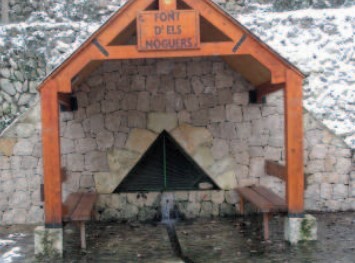 Leaving the town and crossing the bridge at the entrance to the village, you will be able to go to the “Els Noguerets Recreational Area”, where there are tables where you can eat and spend a nice time in the middle of nature and enjoy an excellent Mountain spring water. From the village and following the path of “La cova”, in the “La Font” square, you will be able to make a small excursion until you reach the wonderful place of “Pla La Cova” where you will be able to enjoy a magnificent natural landscape . Old corrals where cattle were once kept, naturally formed under the rocks.